One St. Louis neighborhood not to miss is the Central West End. Just minutes west of downtown, the CWE is where you’ll find scores of shops, historic architecture, and establishments for food and drink. 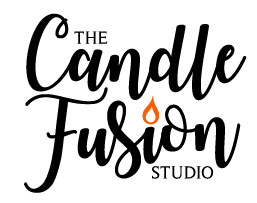 On McPherson Avenue a few blocks south of Delmar Boulevard is a festive, hands on small business we’re excited to introduce to State Gifts USA readers … The Candle Fusion Studio. The Candle Fusion Studio also offers private labeling and corporate branding / client appreciation opportunities – click through to their website to discover all they offer … and if you live in the greater St. Louis area, stop in for a visit and find the perfect personal gift. Proudly Made in St. Louis! On a recent trip to south central Illinois, we visited a specialty grocer and brought home a variety of products from surrounding states to try. We found a real gem in Hendrickson’s Original, a unique salad dressing and marinade that’s made in St. Charles, MO. 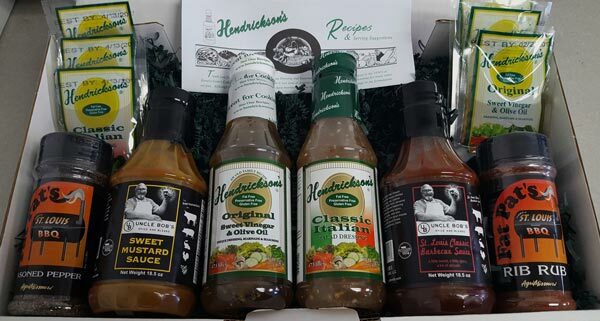 Hendrickson’s also produces a Classic Italian Dressing and if you live locally, you’ll find a Store Locater tab at their website. Single serve pouches are available too! 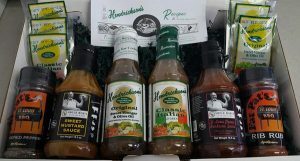 Check out the Hendrickson’s Gift Box (shown) – a great gift for the chef on your list or anyone who appreciates healthy and fresh! 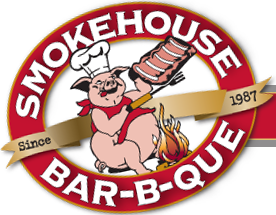 Somkehouse BBQ is perfect whether you want to dine in, carry out, or have it delivered across the country. They’re one of the few KC style BBQ joints with a thriving online ordering system that allows you to experience great BBQ no matter where you live. Smokehouse offers over a dozen different packages to allow you and your group to get your KC BBQ fix. We like the Holiday Feast package, which includes just about everything – ribs, brisket, pit beans, burnt ends, cheesy corn, and sauce. It feeds about 10 people and makes a great gift! Go to their site and click on the “Gifts” icon … you’ll see all the packages to choose from. You can’t go wrong with Kansas City barbecue! 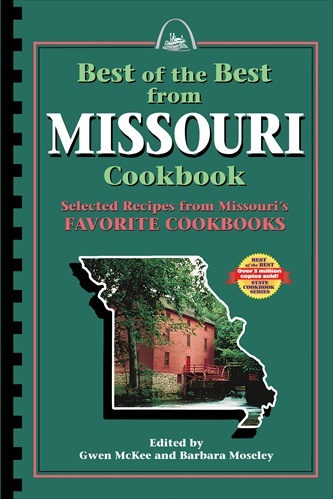 A great gift idea for anyone who holds a warm feeling for Missouri, it’s available for order directly at the Quail Ridge Press website. This company has been doing a great job putting together cookbooks profiling each of the 50 state’s best known recipes. It’s provel cheese, which isn’t necessarily unique to St. Louis although it’s not easy to find. 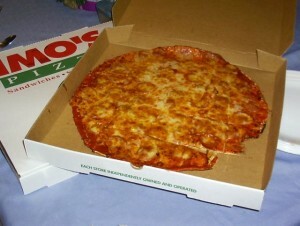 Provel is a blend of provolone, swiss, and cheddar cheese. 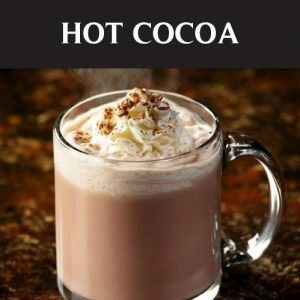 It has a low melting point and an unbelievably smooth and creamy texture. It’s used on pizza here and on many other dishes calling for cheese because it’s so good. This small operation makes two varieties of sauces – Sweet & Tasty and Sweet & Spicy. They’re both excellent! A perfect balance of sweet and tangy, the Sweet & Spicy adds a pleasing jolt of heat for those who like a little kick. 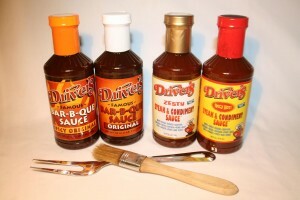 As good as these sauces are on pork sandwiches, do yourself a favor and mix a spoonful or two into potato salad! We admit we did it by accident at first but the results are something special! Help out a small St. Louis business who are making some really good sauces – if you don’t live in the area you can buy directly from the Web Store located at their site. Show Me the good sauce! Two Men & A Garden: This small company was formed when two families decided to combine their backyard gardens and share the tasks of planting, weeding, tilling soil, and enjoying the seasonal bounty! As for the cucumbers, they’re made into Dills, Spicy Dills, and Sweet Pickles, all of which are now available directly at the Two Men & A Garden website. They’ve also begun offering a couple of nice gift packages you can mix and match between your favorite pickles and salsa! Sandhill Farm: Everyone seems to have a favorite condiment, and ours is mustard. It’s fair to say we’re always on the lookout for great tasting mustard and we love introducing them to you here on State Gifts USA! Sandhill Farm is best known for their sorghum, a natural sweetener that’s used as a table syrup or in baking and sauces. 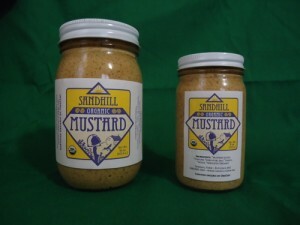 You can purchase it at their site along with their mustard, which we found in a store in Columbia. It’s a spicy natural brown mustard, made with their own sorghum, vinegar, and garlic grown on the farm. Excellent as a dipping mustard, it’s also really good on deli sandwiches! Try it for yourself and see. 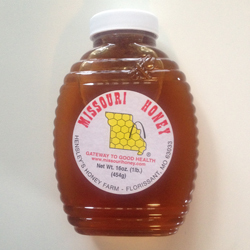 The Farm has a list of retail outlets in Missouri and farther afield on their website, or just order it online. Great stuff from Northeast Missouri! We should’ve bought more than just one jar! This happens to us a lot, but we were nonetheless pleased to learn about and sample this fantastic salsa. 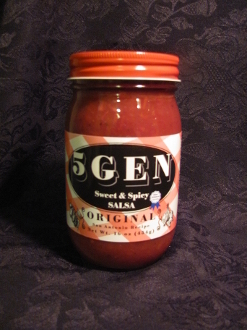 We don’t know a whole lot about the company, but it’s called 5 Gen because the recipe has been passed down through five generations – and we can understand why! We bought their Original Sweet & Spicy variety (they also make a Chunky style). This stuff is so good you can use it as a condiment instead of strictly a salsa – we spooned it on a burger instead of ketchup and the next morning it went on our scrambled eggs. Needless to say it also works well on tacos or any Mexican style dish. The company also makes a Bloody Mary Mix, and just introduced a gourmet ketchup based on their original family recipe. All the products are available directly at their website. Very flavorful and direct from the heart of The Show Me State! Driver’s Foods: Better known in the Jeffeson City and mid Missouri area as Driver’s BBQ, this specialty foods company is family owned and overseen by Annette Driver. Her father Clarence was a well known Missouri Barbecue Champion and opened the family’s first restaurant in 1989. Annette has taken the company to a new level, including marketing the famous Driver’s BBQ Sauce. 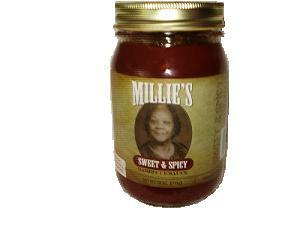 The sauce is available in Original and Spicy varieties, and if you like good barbecue you’ll love this sauce! We came across it recently on a trip through Missouri and used it on our pulled pork and as a dipping sauce with roasted potatoes. With a touch of sweet and deep, rich flavors, this stuff is the real deal! Driver’s BBQ Sauce is legendary in The Show Me State and makes a perfect gift for anyone who loves Missouri. They also make Steak & Condiments Sauces and their Dry Rub, all of which you can order from their website. Discover just what we’re talking about – bring some Driver’s into your home! 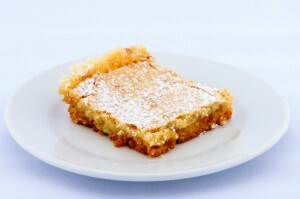 They also sell mixes to make the Gooey Butter Cake at home, and if you like to bake, the recipe to create your own is pretty simple. Click through to their site, and under the Shop tab you’ll see all the varieties you can order. Take our word for it – it’s one of the best cakes you’ll ever have! Pappy’s Smokehouse: Whenever we travel, we’re always on the lookout for great barbecue. No matter where you visit in the U.S., you’re probably not too far from some good Q. On a recent trip through St. Louis, we discovered a really good BBQ joint a couple miles west of downtown on Olive Street near the St. Louis University campus. It’s called Pappy’s Smokehouse and the locals have discovered it – the restaurant sells out almost every day! Pappy’s calls themselves Memphis style barbecue but what struck us is how they smoke their meats. Instead of the traditional hickory wood, they use softer apple and cherry wood for the slow smoking process. Hickory can sometimes be harsh and smoking over apple and cherry imparts a faint fruity flavor which we enjoy. In our estimation they’re perfect for the process of slow smoking pork! 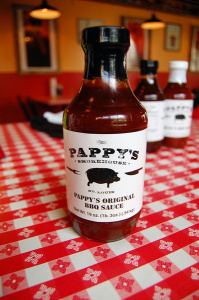 We also really enjoyed Pappy’s barbecue sauces, all of which you can buy online at their website. Pappy’s Original, shown, is indeed a Memphis style sauce with a peppery kick. Holly’s Hot is as it sounds – a hot bbq sauce that’ll wake up your taste buds and Jane’s Sweet is a thicker Kansas City style sauce with a sweet flavor we loved. Their best selling variety is Ozark Sweet Tangy Dills, which start with a burst of sweet flavor. Then, you’ll get the traditional dill taste, followed by a tangy kick at the end. The company also makes a hot version of their Tangy Dills which won a first place award at the national Fiery Food Challenge. 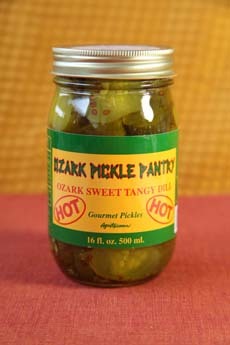 Ozark Bread & Butter and their new Pickles & Peppers round out the product line. The Bread & Butter Pickles have a nice sweet flavor – perfect for livening up your lunch time sandwich! The company is based in Fenton and has been around in one incarnation or another since the mid 1930’s. They’re most famous for the original Red Hot Riplets, but they also make a Cheesy version, hot corn chips, cheese and hot cheese popcorn, and several other flavored chips. 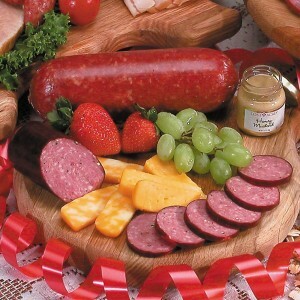 If you’re dealing with another ho hum sandwich for lunch, spice it up with some Old Vienna snacks! At the Old Vienna online store, you can order any of their snacks in cases of various sized bags. Believe me, it will be hard to eat just one small bag, they’re really good! A great gift for someone with a soft spot for St. Louis and you can be certain anyone born and raised there will know about Red Hot Riplets! And did you know … honey is the only food product created by insects eaten by man?? Last time we were in The Show Me State, we discovered a St. Louis area company creating a specialty line of gourmet hot sauces. 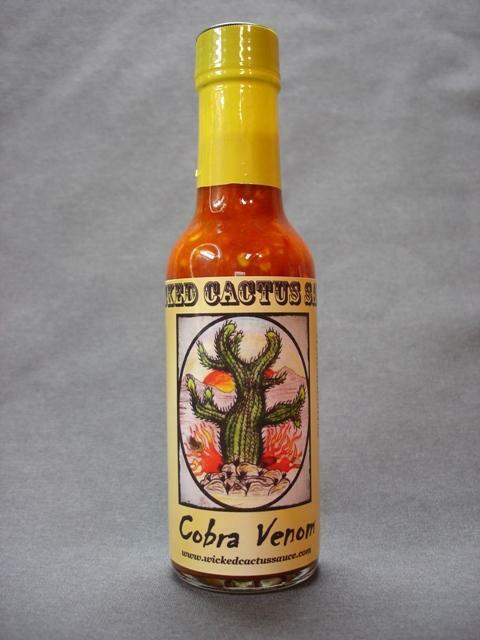 They’re known as Wicked Cactus Sauce, and if you like trying different hot sauces, make it a point to check them out! We were fortunate enough to try two of their line of nine hot sauces, all of which are profiled and sold at the Wicked Cactus Sauce website. The first we tried is called Cobra Venom, a great addition to stir fry dishes that’s not as dangerous as the name implies. A mix of Thai peppers, lime juice, coriander, and garlic gives Cobra Venom a moderate heat that adds a bit of zip to rice based meals. It’s also great with Mexican dishes! The second sauce we tried is Viva La Raza, a milder green sauce made from tomatillos, serranos, and jalapenos. Try this one with tacos or on pita bread sandwiches … also adds an interesting dimension to chicken salad! 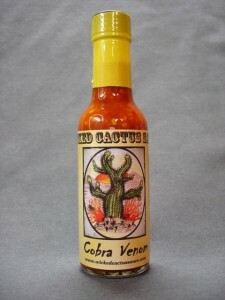 And for those of you who like your sauces hot, Wicked Cactus has you covered. At their site, you’ll find descriptions of all their currently available sauces, including a heat level rating of one to five. “Show Me” the hot sauce! These sauces can be used as traditional barbecue sauce but are much more versatile. They can be used for basting, as a marinade, or simply as a dipping sauce for your favorite foods. Flavors currently available include the Original, Sweet Onion, Sweet With Heat, Sweet Chipotle, Peach, Sweet Inferno, and Pineapple Secret Sauce. At their site, you’ll also find all sorts of combination and specialty tailgate packs – a cool gift! While we’ve never tried any of their pork product, they’re reputed to be excellent. 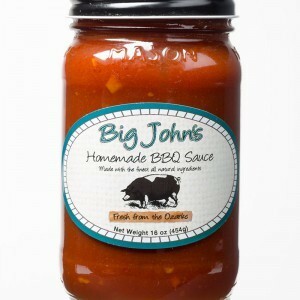 But we have tried their signature Big John’s BBQ Sauce (and it is excellent!). It’s got some unique ingredients, like hot sauce, molasses, ground mustard, red pepper flakes, brown sugar, and cider vinegar. A tasty gift from southwest Missouri! 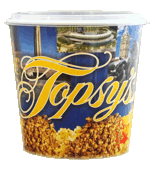 Topsy’s is renowned for their many flavors of popcorn packed in colorful tins. Especially popular during the holidays, Topsy’s Popcorn is also an ideal corporate or special occasion gift. You can choose from a variety of tins and flavors – the Caramel Pecan is one of our favorites! If you’re in Kansas City, be sure to stop at one of their stores and order a flavored limeade drink. They’re made on demand with fresh limes in regular and cherry flavors. We love walking around the Plaza to shop and see the sights and we’re almost always carrying some of Topsy’s products with us! 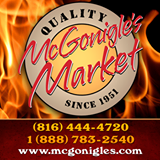 McGonigle’s ships their famous hand trimmed steaks and other items across the country in special packs with dry ice. Your steaks will arrive fresh and ready to grill and serve! Choose from strip steaks, T-Bones, Filet Mignons, ribeyes, porterhouse, and more. You can also get magnificent beef roasts, lamb, pork roasts, and pork chops. A one of a kind place in KC, MO! Finally, there’s Tennessee Red, a spicy vinegar peppery southern style sauce that’s great on a chopped pork or pulled chicken sandwich. Excellent as a marinade as well! 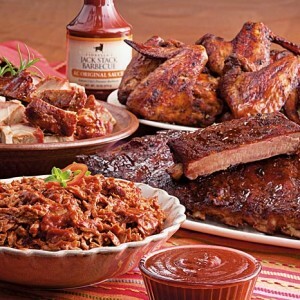 Blues Hog also makes a variety of rubs and gourmet sauces, like their Raspberry Chipotle Sauce. 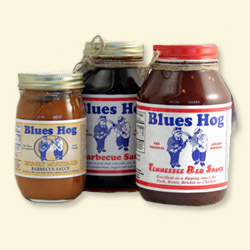 You can buy any of the Blues Hog products directly at their online store – great as a gift from The Show Me State! These pickles are crunchy, with just the right amount of vinegar and spices to let you know you’re eating a pickled cucumber. They’re available in stores in metro Kansas City, and also online via a link on the company website. 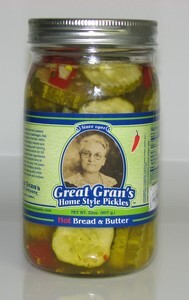 Jack’s great grandmother is pictured on every jar, so you know these pickles have to be good! To directly answer the “why” question, let’s start with what these creative flavors don’t have … no gluten and no high fructose corn syrup like mass produced brands. These ketchups are so flavorful you can use them in recipes – anything from sloppy joe’s to chicken wings to appetizer dishes (check out the recipes on their website). But Fine Vines Ketchup isn’t too fancy to overshadow your favorite cheeseburger, steak, or french fries. Flavors include Smoked Serrano, Grill Smoke, Savory Sweet, and more. We are partial to the Apple Wood flavor (pictured) and use it frequently with pork dishes as a dipping sauce or glaze. Try it on a grilled pork tenderloin! 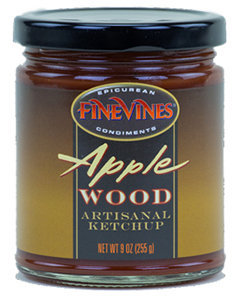 You can find Fine Vines Artisanal Ketchup in many food stores in the KC area, as well as across Kansas and Missouri. They’re in some locations farther afield, but your best bet is ordering directly from their website. Order three or more jars and shipping is free! Fitz’s Root Beer, A St. Louis Icon! Fitz’s Root Beer: One of our favorite St. Louis areas is the Delmar Loop, a six block stretch of Delmar Boulevard in University City (known locally as U-City) immediately west of St. Louis proper. The Delmar Loop, so named because streetcars used to circle back around here, is a vibrant area filled with stores, pubs, restaurants, a movie theater, and the St. Louis Walk of Fame. One of our favorite St. Louis restaurants is located in the heart of the area, Fitz’s Root Beer. Fitz’s actually bottles their root beer and specialty sodas on site – the bottling line is visible from every seat in the restaurant. It’s a fun casual place where you can enjoy great sandwiches, salads, appetizers, pizza … and of course root beer floats! If you ever get to Fitz’s, you’ll grow to love it like we do. Recently, Fitz’s established Fitz’s Online Store where you can buy their famous root beer and their many other flavors. They sell variety packs too in case you can’t make up your mind! There’s other Fitz’s swag available too, like t-shirts, hats, key chains, bottle openers, etc. Discover Fitz’s – A St. Louis icon! The farm is located in Lampe, a small town just north of the Missouri-Arkansas border and not far from Branson. They’re probably best known for their gourmet blueberry muffins, affectionately known as Thunder Muffins. These huge muffins are bursting with blueberries grown on the farm and sprinkled with a cinnamon sugar topping. Just warm them up a bit and serve! Persimmon Hill Farm also creates gourmet jams, shiitake mushroom products, barbecue sauce, syrups, and other specialty foods. Their gift baskets are very popular gifts for holidays, thank you presents, or just about any occasion! Order the fresh taste of the Show Me State directly at their website! These pecans are similar to pecans you’d find in the grocery store, with two exceptions. First, they are slightly smaller. Second, they have a sweeter, richer taste than traditional pecans. The first time you try them you’ll notice the difference! Missouri Northern Pecan Growers sell their pecans online in packages, gift boxes, and a handy sprinkle jar if you plan to use them for baking or salads. These pecans are organic, meaning no herbicides, pesticides, or fungicides are used on the pecan trees. Most everyone knows about the various regional pizza specialties … there’s Chicago style deep dish, New York style thin slices, and Detroit style thick rectangular shaped pizza. But what about St. Louis style? 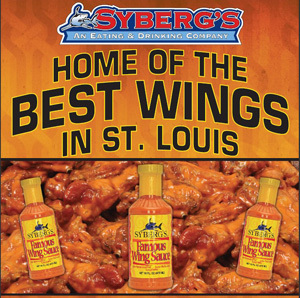 Syberg’s Wings Are Great … Try The Sauce! For a casual meal and a fun happy hour, it’s hard to top Syberg’s. They’re famous for their pizza, shark bites, and especially their wings. Syberg’s has several locations in the metro area … we like the one on Market Street adjacent to downtown. Their wing sauce and how they cook their wings is what sets them apart. The wings are served crispy and the sauce is an eye opener but not over-the-top-burn-your-mouth hot. Their restaurants are family owned, friendly, and everything is fresh. In short, a great gathering spot! 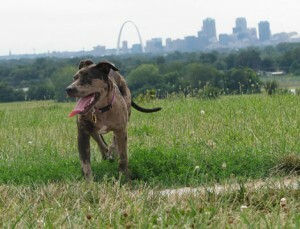 If you can’t make it to St. Louis, get (or give) a taste of the city from the Syberg’s website. They sell bottles of their famous wing sauce and will ship it anywhere in the U.S.! Brick City STL: Do you know someone with a soft spot for the city of St. Louis? 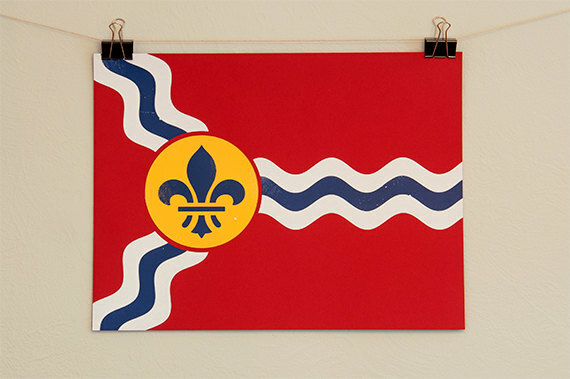 Pictured is a hand made high quality print of the St. Louis flag … it’s very reasonably priced and would make a great accent piece in someone’s home (St. Louis or not!). Jack Stack Barbecue is known for doing lots of things well … pulled pork, ribs, sausage to name a few. We suggest trying the burnt ends, a KC bbq tradition which are basically what they’re called … slightly burnt and crispy edges of meat that create a taste sensation like no other! Zia’s on The Hill Sauces and Dressings: St. Louis is one of our favorite cities … we’ve spent a lot of time there exploring the many great shops and restaurants around town. One of our top St, Louis destinations is The Hill, an iconic Italian neighborhood a few miles west of downtown. 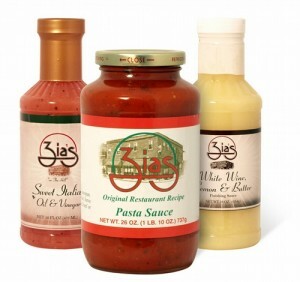 You can buy Zia’s sauces online, and there’s one in particular we recommend. It’s Zia’s White Wine Lemon Sauce, which can be used as a marinade, dressing, or drizzled atop pasta, fish, or meat. Zia’s also sells their pasta sauce and other dressings from their online store, so you can give a taste of St. Louis to the chef in your life. And if you’ve never been to The Hill, add it to your travel destination list! The Cherry Mash bar has a soft cherry flavored center containing maraschino cherries, topped with chopped roasted peanuts and covered with chocolate. If that sounds great, let us assure you … it is! 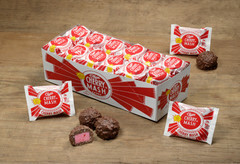 You can buy Cherry Mash bars and other Chase Candies online at the Chase Candy Shoppe … they ship all over the country. 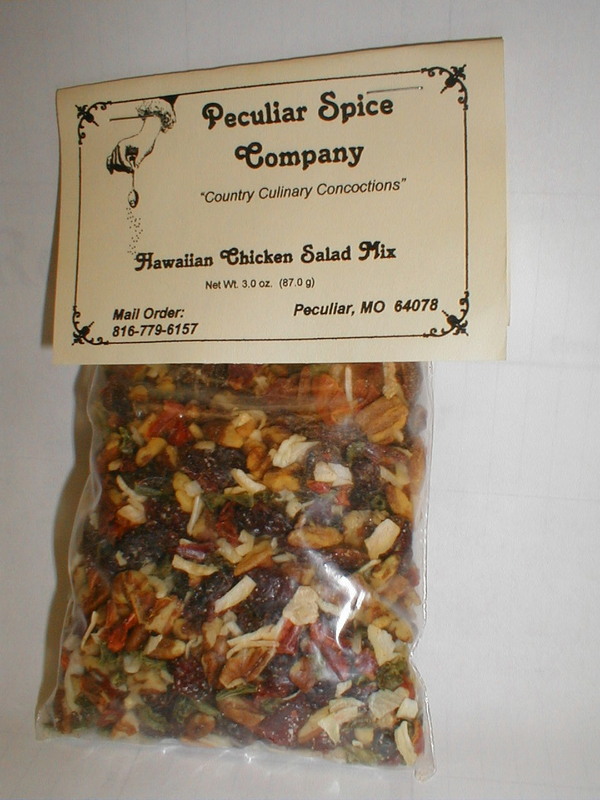 Peculiar Spice Company Peculiar, MO is located 20 miles south of Kansas City. As the story goes, when the town’s founders were trying to come up with a name, all the names they brought up were already taken. Exasperated, a few spoke up and said “Just give us a peculiar name!”. It stuck, and generations later Peculiar is home to the Peculiar Spice Company. The company markets a line of appetizer dips, soup and dessert mixes, and sandwich mixes. 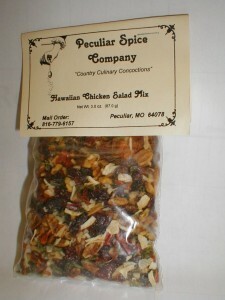 We like the Hawaiian Chicken Salad mix (shown). All you need is a can of crushed pineapple, Miracle Whip, and 3 cups of diced chicken or turkey. Mix it all together, refrigerate to let it all meld, and you’ve got a tasty lunch! Founded in 1965, the company is known as the official bratwurst supplier to the University of Missouri, as well as for their summer sausage, German bologna, and cheese. A great gift for anyone seeking a taste of Missouri is the Swiss Pride Gift Box (pictured), which includes all three of the aforementioned products. 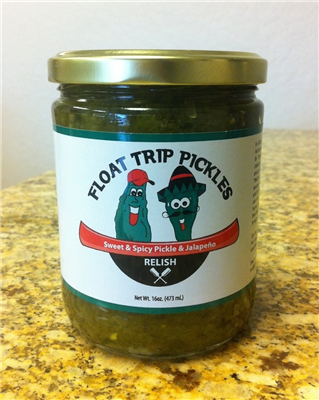 On a recent trip to Missouri, we were able to try Float Trip Pickles Sweet and Spicy Pickle and Jalapeno Relish (pictured). The name describes the taste … it’s a combination of sweet and spicy pickles mixed with jalapeno peppers and fine cut into a relish. Try it on hot dogs! Gates BBQ is actually a small local chain, with six locations in the area. Whenever you enter one of their restaurants, you are immediately greeted with the Gates standard, “Hi, May I Help You?”, as well as the wonderful aroma of ribs, pulled pork, and more. Gates makes four varieties of their signature sauce, which offers the Kansas City style sweet flavor (delicious!). Choose from Original, Sweet and Mild, Mild, and Extra Hot. A gift pack of Gates BBQ sauce makes an ideal Missouri gift! When you visit their location, chances are you’ll be greeted by the Herbaria mascot, a wonderful dog named Soapy. Of course, Herbaria also makes a dog shampoo bar! 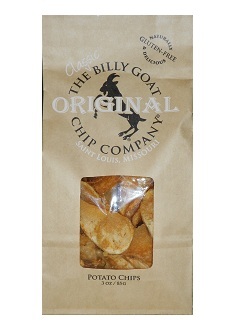 Billy Goat Potato Chips are razor thin and incredibly crisp, with a light seasoning to complement the potato taste. They’re available in several different flavors, from original to red or green chile dust to a spicy ghost pepper flavor.